The main window estos ProCall One R2 gives you access to the functions supporting your everyday work. The significant sections of the main window will be described by the following material. The My Presence section will display the most important information about the status of the phone as well as outstanding appointments. 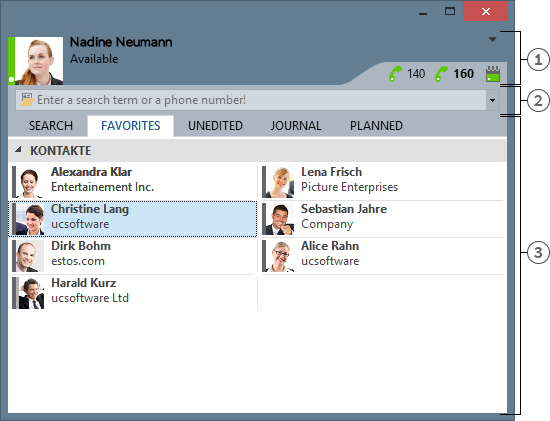 The Call Forward settings can also be configured from there and the calendar can be opened. The main menu can be opened with the main menu button which is situated in the top right corner. It has features which will support you in your daily routine or with which you can adjust estos ProCall One R2 to your personal needs. This menu item will open the Journal Browser. In contrast with the Journal Tab on the main window, you will be able to track all available journal entries. This entry opens Outlook® to show you your inbox. Click here to open the Settings. Here you can define or change the most important estos ProCall One R2 settings. You can use the search input at any time to quickly find your contacts or to simply dial a number. You can immediately re-use the contacts found in the Search tab or save them in the Favourites tab for later use.